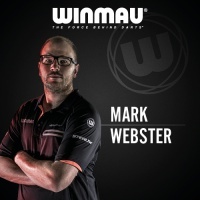 We sat down and had a catch-up with Mark Webster on a recent trip to Winmau HQ. We looked back on the highlights of his career so far, what the future holds and of course his love of dogs! What did you do for a living before you were a professional darts player? Before I turned to darts I was training to be a plumber. During the course I won the World Championship, but still finished. Thankfully I play a lot more darts and do a lot less plumbing now. What was your first darts team and where did you play? My first darts team was in a pub called the Golden Lion. I started off in the B league in Denby, now I play down the bottom end of Denby. Who has had the biggest influence on your darting career, a darts player or somebody else who has influenced your career? Obviously my family have been a big influence around me, keeping me positive. But when I first got in the Welsh team, Martin Phillips was good to me, an older head, making sure I didn’t make any mistakes. We became good friends and I miss him now I’ve moved over to the PDC, but we still keep in touch. What is your favourite memory or achievement while playing darts? Obviously winning the World Championship in 2008 was massive, got me out there. Then crossing over to the PDC, it was nice to have a few good runs, reach a few semi-finals and obviously beating Phil Taylor was a great achievement but I don’t think it eclipses winning the World Championship. How did winning the Lakeside and then moving to the PDC change your career? The first year in the PDC was a bit of a rough ride but from there on it has enabled me to become much more a pro darts player, have a lot more time playing darts and spend a lot less time in the day job. That’s obviously the dream when you start out playing darts, to play full time. What is your favourite venue whilst on tour? I like Ally Pally, obviously the Lakeside as well from the win there. But Ally Pally I always seem to play good darts, even when I have early exits I don’t think I’ve played a really bad game there, it’s got good memories for me. How special was it to represent Wales in the World Cup final? Yeah it was brilliant, the run that me and Gezzy had. I got to the final in the first World Cup back in 2010. I’m out the team now, hopefully not forever, so it’s nice to sign off with a runner up and it was a decent run for the pair of us. You did some commentary for the World Matchplay earlier this year, is this something you see yourself doing more often? Obviously the priority is to be a player and my own career, but it’s something I enjoy and I got into darts because I like watching it, so if I get to work watching darts and commentating on darts that’s a bonus for me. You’re a left handed player, does this affect how you play, for instance a lot of right handed players favour Double 16 or Double 8. Do you prefer doubles on the other side of the board such as Double 10? Yeah I have done in the past, but recently I’ve been trying to adapt. I’ve been leaving Double 16 and Double 8, feeling a lot more comfortable with that region of the dartboard. My ‘go to’ doubles are ‘tops’ and ‘tens’. What do you like to do in your spare time when you’re not playing darts? I like to walk my dog, I like to play a bit of 5-a-side once a week, just try and keep active because obviously we’re away a lot with the darts. Mainly this and spending time with my family. What’s your favourite drink and meal? I’d have to say a soft drink, probably coke. And in terms of a meal liver & onions. K-9, with the dog that’s a police officer, brilliant. You said you like walking your dog, what type of dog do you have and what’s their name? He’s a black Labrador, called Charlie. Bit of a naughty dog to be fair, but good fun. I’ve got a cat as well, but that’s my wife’s. But I look after it more, he’s alright as well, not too bad. I like to knock about with Andy Jenkins, John Henderson, Joe Cullen, Paul Nicholson, but I tend to get along with most players. Finally, of course, congratulations, you’re expecting your second child later this year, how much of an impact will this have on your darting career? Yeah it will have a massive impact, you hear a lot of people say ‘everything you do is for your children’ but when you have children it generally is that. We’re having a little boy, so we’re looking forward to him coming along, hopefully teach him to play darts as well!